This vehicle and pedestrian bridge connects the mainland to a 5-6 mile long skinny island in Duluth referred to as Park Point. 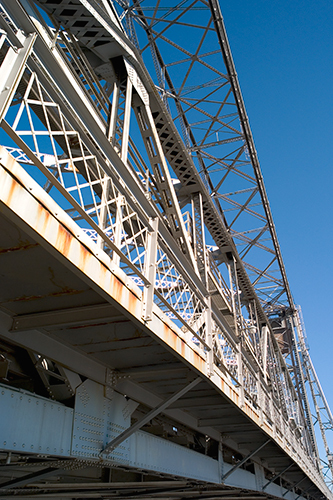 The bridge spans two cement 1200+ foot long piers about 300 feet apart that form the Duluth entrance to the Duluth/Superior port. Each pier has a cute little light house and thousand foot long ships pass under the bridge when lifted allowing spectators within 100 feet of the ships as they slip in and out of the port. I made this bridge photo with a Leica M8 digital camera and Leica 21mm ASPH lens.